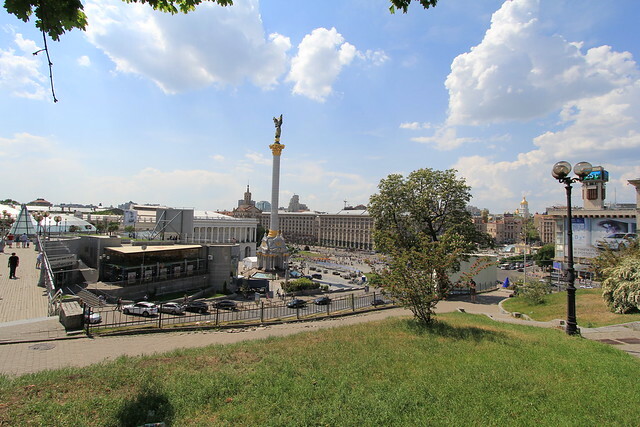 Traveling Morion | Travel + Photography: GUEST POST| Kiev: the Ultimate Capital of Culture? GUEST POST| Kiev: the Ultimate Capital of Culture? Lucky old Kiev. Ukraine’s capital city, set beside the Dnieper River in the country’s central northern region, is not only surrounded by an area of outstanding natural beauty but also boasts an immensely rich historical and cultural heritage. Visitors to this stunning city are bombarded by cultural highlights and landmarks from the moment they arrive. Culture vultures that have devoured the cultural riches of Rome, Paris and Milan will discover untold joy in Kiev: the city contains sufficient artistic, architectural, theatrical and historical treasures to amaze, inspire and satisfy even the most dedicated aesthete. Which begs the question: could Kiev be the ultimate capital of culture? The history of the city can be traced back to the ninth century, and successive generations of inhabitants have left a legacy of architectural diversity that is breath-taking to behold. Nowhere is the contrast between Kiev’s ancient and modern architecture better demonstrated than by the gleaming, reflective glass façade of the contemporary, Luxury Hyatt Regency Kiev Hotel and the stunning Baroque architecture and gilded domes of the eleventh-century St Sophia’s Cathedral which stands just footsteps away. But Kiev’s many places of worship spoil architecture buffs for choice. From the intricate Gothic styling of St. Nicolas Cathedral’ to the pastel blue and gold beauty of St. Michael's Cathedrale, and from the spectacular Kiev-Pechersk Lavra monastery to innumerable churches which date from all periods of history, Kiev’s religious architecture is virtually unsurpassed. Equally unmissable, though, is Gorodetsky House, which is also known as the ‘House with Chimeras’ thanks to the intricately-carved animals which ornament the façade of this remarkable presidential building. Kiev is rich with fine public monuments, sculptures and fountains. The impressive Rodina Mat (“Mother of the Motherland”) is a vast stainless-steel statue which dominates Kiev’s skyline and is part of the city’s Museum of the Great Patriotic War. Equally impressive is the Byzantine-style monument to historic Kiev hero Prince Volodymyr the Great, which overlooks the Dnieper River. Kiev’s statue of Vladimir Lenin is one of the few remaining monuments to the revolutionary Russian leader that were not destroyed following the dissolution of the Soviet Union in 1991. Following attempts to remove the statue it is now constantly protected by guards from the Ukraine Socialist party. Kiev’s contemporary history is commemorated by the touching Afghanistan 1979-1989 War Memorial which honours the nation’s soldiers lost as a result of the Soviet Union’s invasion of Afghanistan in 1979. At locations throughout the city, six ornamental fountains made at the Kiev’s Termena factory have been beautifully restored. Each around a century old, the Termen fountains were originally intended as practical water sources as well as aesthetic features. Modern sculpture is represented by Kiev’s ‘People’s Friendship Arch’. This titanium arc, with a fifty-metre diameter is illuminated by night to create a vast rainbow. Besides covering every aspect of Kiev’s cultural and historic heritage, the city has many diverse and eclectic museums to delight culture fans. Oddities such as the Toilet History Museum, Museum of Bread, Recycled Materials Museum and the FC Dynamo Museum complement museums devoted to Ukaraine’s natural history, Russian art, Science and Technology, Literature and Aviation. Additionally, the city also boasts an observatory and planetarium. Connoisseurs of the performing arts both classical and modern will find a wealth of entertainment in Kiev. Not only is the National Opera House of Ukraine a stunningly beautiful building, its daily performances include opera, ballet and theatre with ticket prices remarkably affordable. Kiev’s circus has been performing since 1875 and is housed in the largest domed building in the city. Highly rated by visitors, the circus’s continually changing acts provide entertainment for all ages. Elsewhere in the city, youth theatre, ballet, operetta and drama all have their own dedicated venues. Art aficionados will be delighted by Kiev’s profusion of galleries. Modern artworks and installations by some of Ukraine’s rising artistic talents can be viewed at Pinchuk Art Centre, whilst the Bohdan and Varvara Khanenko National Museum of Arts features a unique collection of works by European and Asian artists, and is neighboured by the Museum of Russian Art. The National Art Museum of Ukraine, meanwhile, houses a collection of masterpieces dating from the twelfth century onward as well as collections of national icons and sculptures. Consider the advantages of the Kiev apartment's accommodations over the Kiev hotel stay. Kiev's is rich in history and culture which makes it a nice place to explore. It's just amazing seeing a place for its cultural significance. Kiev has a lot of unique structures and a rich history. you're lucky to visit the place... architectural design and other artifacts from other places are fb material... hahaha. kidding aside, love to also visit ukraine. Yahweh bless. I am wondering where is Kiev, where is Ukraine. I am not well-versed of world history. As I search the net, Kiev is in Eastern Europe. It is indeed rich in cultural heritage. This is the first time I heard Kiev and it looks like a great place. wow, all that in one city. You wonder how it is for the whole country? is all this love for culture spread throughout Ukraine? wonderful that they put so much importance to culture.